Wander: The Cult of Barnacle Bay is the first game in the Wander series. A fully cooperative, campaign-driven, miniatures board game, Wander: The Cult of Barnacle Bay tells the story of 5 heroes from the Wanderer's Guild, and their struggle to free the small fishing town of Barnacle Bay from the slimy claws of Elder Bane. Driven mad by power, and physically twisted from dark magic, Elder Bane has created a cult of mutated townsfolk that only desire to spread their message of madness to the rest of the world, bending it to their whim along the way. 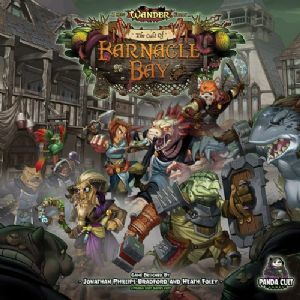 In Wander: The Cult of Barnacle Bay, players will select one of five unique heroes, outfit their hero with starting gear (represented by mini cards on a player dashboard), and join their friends to take back Barnacle Bay. Defeating foes and surviving random encounters earns players experience points and loot. Loot, like weapons and armor, is a persistent upgrade, staying with the heroes as they continue on their adventure. Experience points are used to level up heroes during their current adventure in the campaign. A dual-facing upgrade tree allows players to continually try new combinations of skills each adventure to determine what fits their play style, or current set of foes, best. Using a modular board, players assemble maps as indicated in the campaign book, then use action points to move or attack with their hero. All enemies in the game are controlled by a simple line of sight A.I., and automatically hit the players' heroes once they're able to. This means there is no player rolling for success for enemies' attacks. Heroes will, however, be able to roll for defense in an effort to prevent incoming wounds. One set of custom dice determines a hero's success for both defending and attacking. Random encounter cards, which are revealed when players enter an unexplored "darkness" space, also promise that no campaign adventure is ever the same.